The Grange, also known as the Order of the Patrons of Husbandry, is a rural organization that promotes community values and serves as a vehicle for farmers to mold and shape state policies. The Grange began after the Civil War, when cotton yields skyrocketed and prices plummeted. Facing similar economic problems, farmers nationwide formed the National Grange in 1867 to serve as the political and social voice of their interests. Following the precedent set by this national organization, North Carolina farmers established the state's first Subordinate Grange in Guilford County in 1873. The legislature incorporated the North Carolina State Grange on 20 Feb. 1875. Since then, farmers have used the Grange, in both early and modern forms, to shape the state's commitment to agriculture. The political purpose of the early Grange was twofold. Farmers wanted an organization that would offer them collective power in the market and the strength to force the state legislature to establish a Department of Agriculture, which it did in 1877. With this achievement, Grange chapters dwindled. By the 1890s farmers looked to other political organizations, such as the Farmers' Alliance and the Populist Party, for relief. By the 1920s high yields, low prices, and railroad monopolies caused farmers to reconsider the older organization. The new North Carolina Grange was organized on 27 Sept. 1929, but its objectives had changed. Although this Grange was committed to many principles of the early Grange, the state's experience with Populist politics afforded farmers a new knowledge of government. Grange members now pressured the legislature to provide rural electrification and telephone service. Grange committees sought to improve highways and education, as well as to promote tax reform and agricultural science. The new Grange again established cooperatives to raise prices. One of the most significant differences between the old Grange and the new was the change in leadership. Women asserted a public role that was unprecedented in the early Grange. Margaret Caldwell, wife of Harry B. Caldwell, a former state Grange master, held the same post (1946-48, 1963-75). Beginning in the 1930s, she built up the Juvenile Grange to train children in leadership, agricultural science, and community responsibility. Frances Perkins, labor secretary in the Franklin D. Roosevelt administration, appointed Caldwell to the national Advisory Committee on Maternal and Child Welfare. Caldwell, like her forebears, pushed for federal price supports so farmers could make a fair profit; yet her experiences as a wife and mother enabled her to shape the Grange into an organization that supported not only farm families but also rural women and children. The North Carolina Grange has produced state leaders such as Governors W. Kerr Scott, Robert Scott, and James B. Hunt Jr. and Commissioner of Agriculture Jim Graham. The modern Grange has encouraged youth education and organized the first continuous rural group health insurance program through Blue Cross and Blue Shield of North Carolina. Stuart Noblin and Bill Humphries, Hold High the Torch: The Grange in North Carolina, 1929-1989 (1990). "An Act to Incorporate the North Carolina State Grange, Patrons of Husbandry." Laws and resolutions of the State of North Carolina, passed by the General Assembly at its session 1874-'75. Raleigh [N.C.]: Josiah Turner. 1875. p. 524-525. http://digital.ncdcr.gov/u?/p249901coll22,195579 (accessed October 19, 2012). Noblin, Stuart. 1954. The Grange in North Carolina, 1929-1954; a story of agricultural progress. Greensboro: North Carolina State Grange. Noblin, Stuart. 1961. Codification of grange policy. [Raleigh, N.C.]: Dept. of History and Political Science. 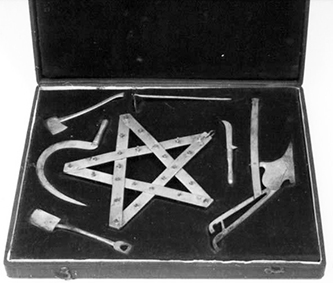 "Box of Ritual Items, Accession #: H.1955.46.1." North Carolina Museum of History. What is one of the little tool kits worth? I have the opportunity to buy what they call a minature one. Thank you for your help. NCpedia is an online encyclopedia and, unfortunately, we’re not able to help viewers with artifact questions or appraisals. However, I can provide a few resources that might help. First, you may want to contact an antiques dealer. The NC Museum of History may be able to help as well. Here is the link to their contact information page -- http://ncmuseumofhistory.org/AboutUs/ContactInformation/Whotocontact.aspx. Scroll down to “artifacts?” entry and you’ll find contact information for questions about artifacts.